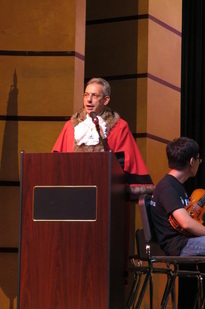 The Deputy Lord Mayor of Westminster, England along with other Westminster dignitaries, visited Santa Fe High School to invite the band, orchestra and choir to participate in the 2017-2018 London New Year’s Day Parade, Gala Orchestra Series and International Choral Festival. The Parade features 8500 performers which organizers contend is twice as many as the Macy’s Thanksgiving Day Parade. In addition, it is viewed by a worldwide TV audience of some 300 million people. When presenting the invitations, the dignitaries gave various gifts to band, orchestra and choral directors including umbrellas. They urged the directors to not let the umbrellas out of their sights until the parade in order to ensure good weather. During the 2014 parade, the Edmond Santa Fe Band marched in frigid temperatures and rain. Follow us on social media or complete the contact us form if you have comments or questions.